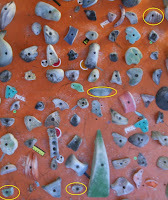 Another steep crimping testpiece, most of the difficulty of this climb is due to the size of the holds. The movement between them though is also not trivial or just tick tacking up small holds, a very hard jump in the bottom to a very small hold to a pretty long cross through off meager feet near the end. Here is the video: http://vimeo.com/7118495 I actually tweak my finger a little bit in the video. The second move, I grab a crimp and start to close it, and if you watch closely it snaps closed strangely, which hurts my pinky and ring finger, strange. Here are pictures as though as it is hard to see exactly how the climb goes just by video. The pictures do not show the start; Start Organic/Petzl with a small blue jib down and left then go to first crimp shown etc.